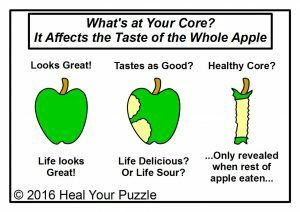 Heal Your Puzzle » Blog Archive » Do You Have a Healthy Core? Do You Have a Healthy Core? It is an accepted part of any fitness programme, back injury rehab or after pregnancy these days to include exercises for your Core Muscles, the deeper abdominals that support your spine and your posture when standing or during movement. But do you ever consider the Core of your Being? …the deeply held thoughts and beliefs which underpin and support who you are as a person, the ideas that seem unchanging, that seem truly you and that you will defend at all costs..? Are they still valid? Are they based on the You of 10 or 20 years ago? Can’t Break Out of a Long-Held Routine? Want life to blossom and it feels hindered? It may be that even though your life has outwardly grown and moved forward, inside you feel stuck, stagnant or unhappy… you try new things and they fail, maybe over and over again… a dream you want to work towards just never gets in gear… You may have started to lose hope or are unsure now what path to put your energy into since nothing so far has succeeded and, even though you outwardly make an effort, things don’t seem to work out as you wish… or you may not feel in charge of your life at all. Your Life to others may seem bright and shiny like a freshly picked apple but you may not feel that way inside. Self-Development? Hasn’t Helped? When we get discontented with our life or we suffer some distressing events, we may turn inward and look at ourselves and ask ‘Why?’ or ‘How?’ We may seek help or understanding from friends, family or health professionals… but has anything helped? Did anything change for the better? Core Work is at a Deeper Level Just like when you do your core abdominal muscle exercises, you feel it working much deeper in the body than the usual routine, therapeutic Core Work tackles deeply rooted ideas that will only usually become visible when a route has been found through all the more superficial, although still important and still challenging, ideas that shape our lives. The Core however is not separate to these ideas, it is in fact fundamental to how all these ideas have formed. So given a bright, shiny fresh-looking apple, when you bite into it, does it taste delicious or sour? The health of the Core will influence this taste even though you have yet to eat the flesh of the apple and reveal its centre.